This is one of my favorites to whip up. I call this one a California Veggie Rice Bowl. When we are short on time and looking to get a nutritious meal quickly this is what we reach for. I use my prep days on the weekend to prepare quinoa and brown rice so that I have it on hand. Then I have these for any recipes throughout the week without the extra cooking time. Making the brown rice in this dish ahead of time works great when your short on time. I like to have items that are ready to go so that I don’t get stuck without the time to cook healthy. When you do these little preparations you will be surprised how the time factor never becomes an issue. This is really about being prepared and setting your health and lifestyle up for success. This meal comes in at about a $1 per bowl which you can’t beat. Packed with nutrients this affordable meal is a delicious pick for the whole family. Take your prepared brown rice out and heat up a bowls worth (about 1/2 cup per bowl). Once it is warmed sprinkle it with a some organic rice vinegar and set aside. 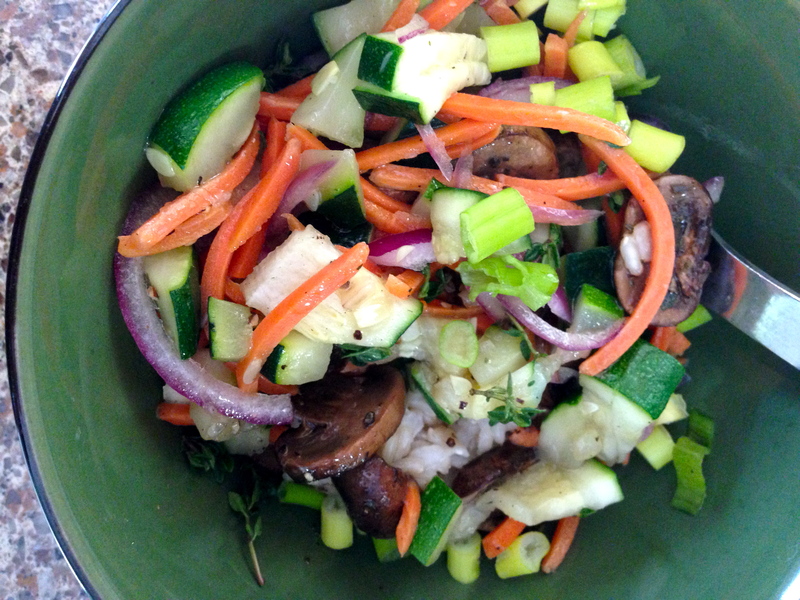 In a small skillet on medium heat add the coconut oil, onions, mushrooms, zucchini, and carrot. Sprinkle with sea salt and pepper. Cook on medium heat for 3-4 minutes until mushrooms are cooked. The rest should be crisp and al dente but warm which will keep the nutrients intact. Once the veggies are done top them over the rice and sprinkle with fresh scallions, fresh thyme, and sesame seeds. This recipe takes no time at all and your body will thank you with the clean fuel it provides and energy to push you through the day. You can easily make this for a family by simply increasing the ingredients.